Little Slate Creek, Little Slate Creek North, North Fork Slate Creek, and John Day Click on the image to enlarge and zoom. 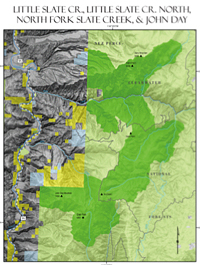 John Day Roadless Area is 10,000 acres parallel to Highway 95 northeast of Riggins, Idaho. Located on a high ridge between the Salmon River and Little Slate Creek, it is separated from the latter roadless area by a road corridor on top of the ridge. Elevation ranges from 3,800 feet at the National Forest Boundary to over 7,000 feet at the main topographic features: John Day Mountain and Southwest Butte. The main ridge runs north to south, the slopes abruptly perpendicular with hardly any flat benches and dropping sharply into draws. On the slopes facing the Salmon River canyon to the west vegetation ranges from non-forested land to a scrubby alpine zone. South slopes contain mostly grasses with scattered trees at higher elevations, while north slopes are timbered with white bark pine and Douglas fir primarily and a minority of ponderosa pine. The headwaters of Allison Creek and John Day Creek within the roadless area provide cool, steadily flowing waters needed for anadromous fish like steelhead, Chinook summer/fall salmon, and bull trout. Bald eagles use this area. Since the area is at or near the top of a ridge, it is primarily hunters who use the steep terrain as strategic vantage points. Off-site intrusions and ORV damage pose the greatest threats; an ORV trail running through Southwest Butte accelerates erosion and displaces native wildlife.